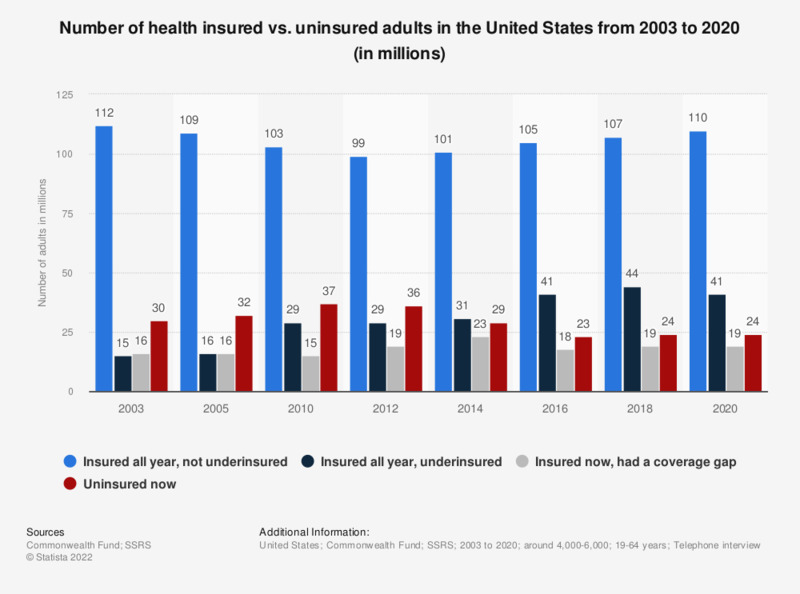 This statistic displays the number of health insured vs. uninsured adults in the United States from 2001 to 2018. According to the survey conducted, the number of currently uninsured people dropped from 37 million in 2010 to 23 million in 2018. Notes: "Uninsured now" refers to adults who reported being uninsured at the time of the survey; "Insured now, had a gap" refers to adults who were insured at the time of survey but were uninsured at any point during the year before the survey field date; "Continuously insured" refers to adults who were insured for the full year up to and on the survey field date. * 2018 figures were calculated based on given percentages.